PressPass a new startup from the MENA region is looking to help people get their stories out. I was contacted recently by one of the co-founders and was impressed by the site’s design and idea in general, so I wanted to find out more about presspass and what they’re looking to achieve with the website, so I sent them some questions to get their feedback and insights about starting such a venture in the region. We’ve launched the directory with over 5000 journalists from 250 media organizations. Regardless of social media, journalists are still behind large amounts of information the public is exposed to every day. A big part of their job is to filter and package information sourced from the community around them. We wanted to make that interaction between journalists and their ecosystem more pleasant for everyone involved and the Press Pass directory is our first step in that direction. Where is Press Pass based? And whom are you targeting? At the moment we are based out of Dubai. PressPass has two target audiences. Our first is journalists & media organizations (from every region across the world). Our second are the people who want to reach out to them – small businesses, non-profits, start-ups and citizen reporters. Who are the key players at Press Pass? You are currently in Beta, when are you planning the official launch? Yeah, we’re in public beta at the moment, no official plans to move out of beta yet. For now we’re focusing on making the platform better through feedback from both our target markets – the journalists, and the people who want to connect with them. What are you hoping to achieve with Press Pass? Journalism is penetrating into areas it’s never been before, and has started to invite others to participate in the story-telling process. Through PressPass, I’m hoping that everyone who has a newsworthy story will be able to not only find the right reporters to get their word out, but build trustworthy relationships with them. How does Press Pass work? Find your reporter: All our listed journalists are organized by the outlets they work for, the beats they cover, and geographical regions they’re from. 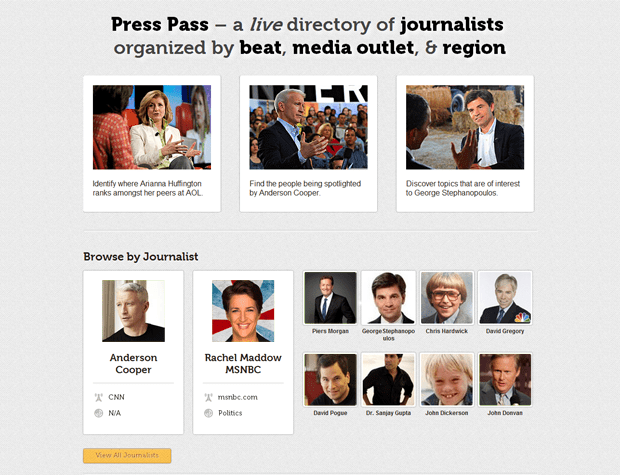 Browse PressPass, and find the journalists who are relevant to your story. Understand the reporter’s profile: Each reporter’s profile contains what they’re sharing online, where they rank in comparison to their peers, the topics they care about and who’s getting their attention. We’re currently tracking hundreds of thousands of tweets a day, with each tweet continuing to build and refresh each journalist’s profiles. We use this information to help our users to get a more in-depth understanding of the reporter, ensuring that you’re pitching your content to the right people. It also helps journalists receive leads on stories they’d be interested in. Pitch your story in 140 characters: Once you find the right reporters, send them your pitch directly through a tweet. Since journalists are often on tight deadlines, it helps skip long emails and start the conversation immediately, whilst being linked directly to the source. Why do think people will use Press Pass, What is your favorite feature on the website? Previously I launched a couple of non-profit social good websites, and I always found the process of reaching out to journalists to cover some of my causes awkward and time-consuming – since there isn’t a central location to be able to find reporters, and when you did find them, it took a while to figure out the type of stories they covered. As someone who was trying to run everything by myself, time was a resource that I couldn’t spare. So consequently, I never ended up reaching out to the press to cover any of my efforts. People will use PressPass simply because they want their news-worthy achievements to be covered, but don’t have a lot of time to spend searching for the right journalists. My favorite feature would be discovering which journalists work in certain beats. Prior to working on PressPass, I always thought that each journalist just covered anything and everything that came their way. I wasn’t aware that journalists mainly worked on certain types of stories (ie – focusing on the environment, education, etc) – go figure! Currently the website is focusing mostly on foreign Journalists, why is that? And how do you plan to approach the regional journalists? Honestly, it was easier for us to find them. There are huge Twitter lists that contain most of the journalists from North America and the UK, so that became the most obvious way to start. However, we are in the process of developing a new tool that will allow us to efficiently input journalists from other regions. Once complete, we’re going to start adding journalists from the MENA region, since we’re based here, and then expanding strategically. Our goal is to have every journalist from every region across the world, and this will help us achieve that mission effectively. Have you carried out any marketing and if so, what have you done so far? Firstly, we’ve built the entire platform through Twitter. This allows all our communication to occur socially. We add journalists through Twitter, they send us feedback through Twitter, people use Twitter to reach out to the journalists. This was done by design, to allow for organic growth. Secondly, it helps to be working with journalists to begin with. We’ve started building relationships with a few of the journalists and journalism organizations, who are excited by what we’re doing. We’re not looking too far into the future yet. Currently we’re focused on gaining some critical mass, and tweaking the directory based on user feedback. Twitter is utilized more than Facebook for journalists, which is why building the platform through Twitter made sense for us. Guest blogging is another really effective method for getting the word out to people in your particular target market. You’ll not only receive link backs to your platform, but will also get some great feedback from the people who use it. People who read blogs are generally your early adopters. Any tips for better marketing? Building a great product is the best marketing, which is why we’re so focused on getting feedback from users. Making sure that your site has an easy to use interface, is built to be search engine friendly, along with social parameters to help it grow virally. Another tip is to find the right social network for your idea, and be great on that particular platform. Don’t spread yourself thin over multiple networks, at least in the beginning. Go where your audience is, and set up shop. Given that you have experience with startups before what should start-ups from the region focus on when marketing their products/services? Try to find co-working spaces to work out of. Working on a startup can be a lonely process, and being around other like-minded entrepreneurs is a great way to not only get to know other startups in your area, but also get critical feedback on your product, so that you can iterate while you’re still building it. David and I spend a lot of our time working out of the Shelter in Dubai. Also, try to attend, or even host relevant meetups in your city. This helps you keep abreast of what’s going on in your particular community. David and I host a “Founders drinks” meetup once a month, so that we can just kick back and catch up with other startup founders in Dubai. Stay focused on your vision, and aim to build something that your audience will actually use. Get feedback early, often, and iterate on that information accordingly. I’d really like to thank Valencio for taking the time to answer my questions and giving his insights, we wish the PressPass team the best of luck. Thanks for the post Tariq. Was a pleasure being interviewed.